With the senses filled with the scent of colourful tulips and the sight of towering windmills, food may not be the first thing that springs to mind when you turn your mind to the Netherlands. But much like France and Germany, the country is positively filled with delicious culinary delights just waiting to be tried. From the aptly named ‘Cheese Valley’ to the sweet treats of speculaas and stroopwafels, your mouth will be watering after reading our food lovers’ guide to the Netherlands. Cheese has had a place in the Netherlands since the Middle Ages, with some of their most famous exports named after the cities in which they were created. Indeed, you’re likely already familiar with the likes of Edam, Leyden and Gouda – and across the country shelves in local shops and delicatessens are filled with artisan cheese, so wherever you go, you won’t be far from delicious ‘kaas’. 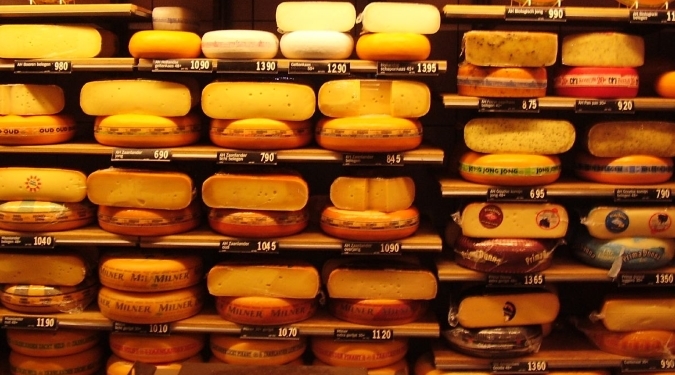 Located just north east of Rotterdam and split into four regions, Cheese Valley encompasses Gouda, where visitors can still attend the city’s legendary cheese markets, Bodegraven-Reeuwijk, the nation’s cheese trading centre, and Woerden, which holds cheese style pageants every year. To the south of Gouda, Krimpenerwaard is a place of rolling country hills where the region’s dairy cows roam – the best place to buy authentic, farm-made cheese straight from the source. What could be better than starting the day with hot toasted bread, slathered with a delicious spread of creamy butter? Well, if you’re in the Netherlands, you’re likely to top that breakfast off with sprinkles too. 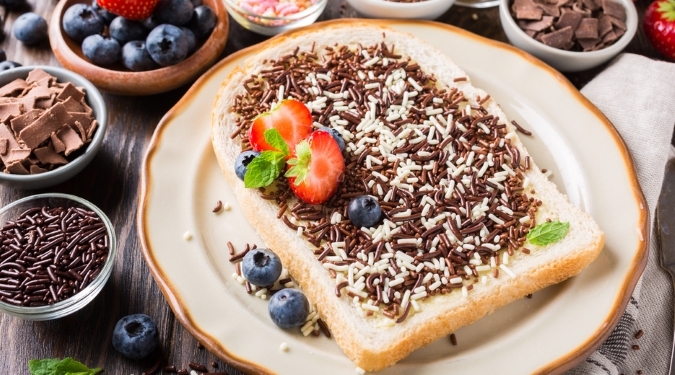 Named hagelslag, these toppings are dusted liberally over buttered toast, and come in a variety of flavours – from chocolate to fruit. You can pick up a box for yourself from many local supermarkets, and many cafés and restaurants offer up their own twist on the dish. For lunch, Hollandse Nieuwe or ‘raw herring’ is hugely popular with locals and tourists alike. Available in street stalls and traditional eateries, the fish is frozen, before being rolled and placed in salt for a couple of days – so technically this dish is soused rather than raw. Though often eaten on its own, you can also try it in a sandwich (broodje haring) at most typical Dutch food markets. If you’re after something warm and comforting, be sure to sample a steaming plate of stamppot, which is essentially sausage and mash with vegetables – perfect after a day of city exploring. If you prefer your fish fried, kibbeling are battered bites of cod, served at most street market stalls with a herb-infused sauce. Bitterballen, which is essentially deep fried gravy and meat, are a similar savoury treat served as a precurser to drinks among locals – the name is derived from bitters, a botanical ingredient common in cocktails. For something a bit sweeter, Oliebollen are sweet fried dumplings dusted in powdered sugar. They’re generally only available around New Year’s Eve – so grab them while you can. For a sweet delicacy available all year round, head to one of the country’s pancake houses for a poffertjes (pronounced po-fer-jus). These small buttery morsels are best served with powdered sugar, and are also available from street vendors around the Netherlands. One of the best ways to see the real side of a city is by taking a trip to a local food market. Amsterdam in particular is known for its multicultural influences, something you can see in the dishes served up in their many markets. Albert Cuypmarkt, which has been open since 1904, is one of the country’s biggest with over 300 stalls. 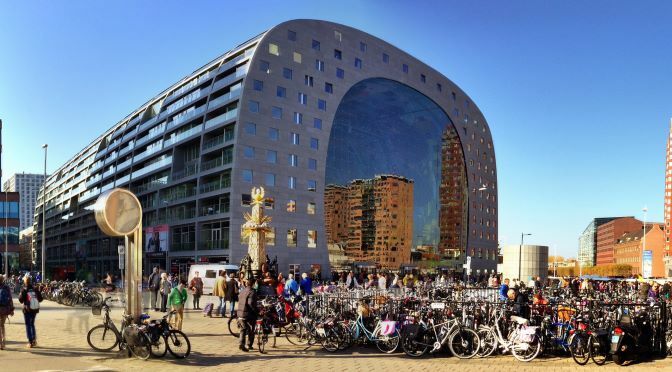 Rotterdam too has a thriving food scene, which is seen in full swing at the famous Markthal. 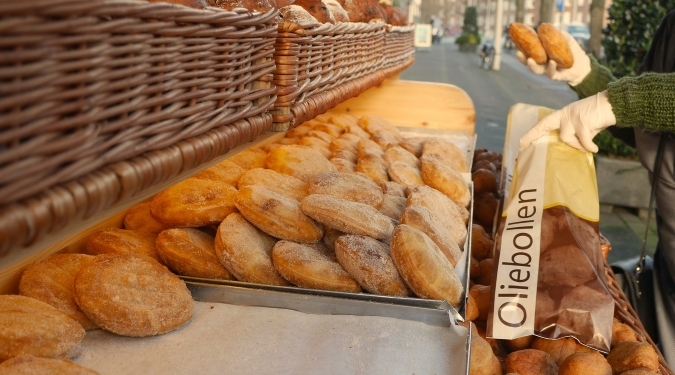 With over 100 food stalls, you’ll find baked goods, sweet treats and hot drinks as well as plenty of local produce. Speculaas are the perfect treat to take home to loved ones, especially at Christmastime when these spiced, caramelised biscuits are available in an abundance of festive shapes. Stroopwafels are another safe bet to survive the journey home – hailing from Gouda, these sweet waffles are essentially two thin wafers that have been fused together with delicious caramel. 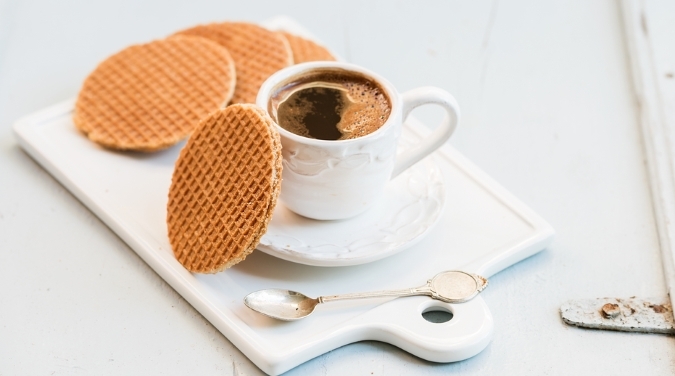 You find stroopwafels almost anywhere in the Netherlands, and they’re best enjoyed with a cup of steaming coffee. Be sure to also stock up on Ontbijtkoek, a delicious ginger bake that’s also ideal for elevenses, even though the name literally translates into ‘breakfast cake’. Fancy taking a foodie’s trip to the Netherlands? Take a look at our crossing from Hull to Rotterdam.